Cassiana (Cassiano x Pionier) jumping at Takapoto Estate. The breeding game isn’t for the faint-hearted, but East Coast Performance Horses’ Nicki Booth thrives on the challenge it presents and is super excited for the future. She does a huge amount of research, particularly over the wetter winter months, to make sure the matches are perfect, as well as seeking advice from leaders like Dr Lee Morris and her team at EquiBreed along with the likes of VDL’s Janko Van De Lageweg. “It does all depend on the mare but I think the Dutch have their bloodlines well nailed at the moment and I am pretty happy with the stallions I picked from Europe to use last year.” Included in the predominantly VDL mix was Paul Ffoulkes’ Candyman GNZ, some new young blood and a throwback to the 1980s. The Masterton based ECPH operation is very much a family affair and Nicki says she couldn’t do it without the support of her parents Jenny and Craig who take care of things while she works as an equine technician three days a week. 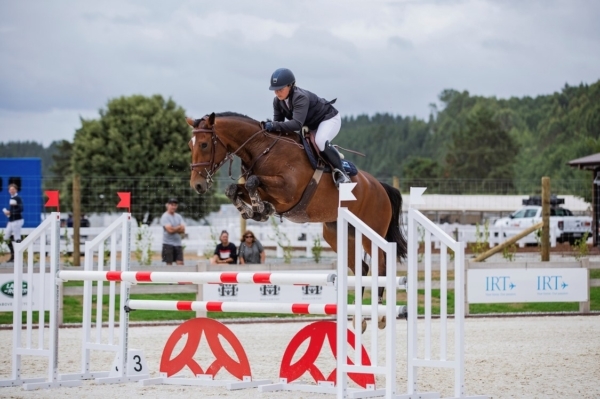 Nicki did get a little competitive riding herself this season, but her focus is very much on breeding New Zealand’s next superstar showjumper.